The rollout of a nationwide self-exclusion system for Australians trying to quit online gambling is set to be delayed because of Queensland, as the state has remained the only Australian jurisdiction that is yet to approve the proposed measures, news outlet the Sydney Morning Herald reports. The self-exclusion scheme has been in the works for over three years and aims to help people with problem gambling behavior and gambling addicts quit gambling on the nation’s licensed betting websites. All other Australian states and territories have officially agreed to introduce the self-exclusion system, but Queensland legislators are yet to vote on it which will imminently delay the introduction of the proposed reforms across the nation. The scheme, known as the National Consumer Protection Framework, includes a new set of tools and standards intended to curb problem gambling and strengthen existing consumers protections within the online betting space. Aside from a self-exclusion tool allowing gamblers to ban themselves from gambling on licensed websites and apps, the framework also includes a voluntary pre-commitment system allowing bettors to set their own betting limits as well as a nationwide ban on bookmakers to provide “inducements” to lure customers into registering with their websites. As mentioned earlier, Queensland has remained the only Australian jurisdiction that is yet to approve the National Consumer Protection Work. It is understood that the federal government has been urging Queensland Attorney General Yvette D’Ath table the responsible gambling measures to the state’s government and press for quick approval of those. A spokeswoman for Ms. D’Ath has told the Sydney Morning Herald that the Queensland government has been working on its own problem gambling framework that will also be consistent with the nationwide scheme. State lawmakers have informed the Attorney General’s office that both frameworks will be finalized by the end of the year, the spokeswoman has added. Lauren Levin, Policy Director at Financial Counselling Australia, has been among the most active lobbyists for the responsible gambling reforms. In recent comments, she has said that the implementation of the nationwide self-exclusion program is “desperately needed” and “urgent” and that the government should make it its priority. The proposed measures have received support from Australia’s largest bookmakers, including Tabcorp, Sportsbet, BetEasy, bet365, Ladbrokes, and Unibet. Lobbyists are pressing for urgent reforms in the nation’s responsible gambling policies at a time when studies are showing that Australians are the spendiest gamblers in the world. According to the latest data published by the Queensland Government Statistician’s Office, Australian gamblers wagered A$209 billion in 2016/2017, up 0.7% from the prior year. In addition, one of the latest snapshots of problem gambling in Australia, provided by the Australian Gambling Research Centre, shows that around 7.5% of the nation’s population, that is around 1.4 million people, are experiencing a low, moderate, or high level of gambling harm. The post Delayed Action in Queensland Sets Back Launch of Australia’s Nationwide Gambling Self-Exclusion Scheme appeared first on Casino News Daily. The WSOP Circuit has its brand new Main Event champion and his name is Scott Sanders, a 30-year-old recreational player from Santa Clara, California. The player outlasted a star-studded field of 442 competitors to collect last night his second gold ring from the series and a hefty $147,314 first-place prize. 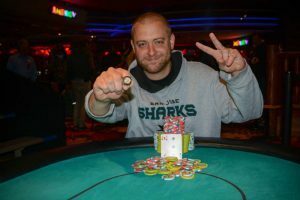 It is also important to note that Sanders captured his first gold ring just a few days ago when he bested the field of the Monster Stack event at Harveys Lake Tahoe. The final day of the Main Event was played yesterday at the host casino. There were only four warriors left to battle for the title, the coveted ring, and the cash prize, and Sanders was holding the second biggest stack at the time when cards were thrown in the air to mark the beginning of Day 3. The eventual champ was second only to Stephen Song at that point in play. However, despite his start-of-the-day advantage, Song was the first to leave the race on the final day. The player scooped $49,392 in prize money for his deep run in the Main Event. Brett Murray was the next to go, good for $66,521. And finally, Sanders faced two-time gold ring winner Nick Pupillo heads-up. It was not meant for Pupillo to claim his third title from the popular poker series. It should also be noted that the player was vying for his second WSOP Circuit Main Event victory. Pupillo’s consolation prize from the tournament at Harveys Lake Tahoe totaled $91,036. As mentioned above, the Main Event drew 442 entries who created a $669,630 prize pool. The money was distributed to the top 45 finishers, with min-cashes being worth $3,027. The money bubble burst on Day 2. A major mistake could have ended Sanders’ participation in the Main Event on Day 2. During one of the hands dealt on the second day of play, the player accidentally shoved out of turn for his 13 big blinds. It was Michael Hubbards’ turn. A Tournament Director was summoned to the table and he ruled that if Hubbard limped, Sanders’ bet would have to stand. However, if Hubbard decided to raise, then Sanders would be allowed the option to fold. Hubbard eventually raised, and Sanders folded. A third player tabled pocket queens, which would have certainly ended Sanders’ run in the tournament. In his post-victory interview, the newest member of the WSOP Circuit Main Event champions club praised his three remaining opponents from Day 3, saying that they all played great. Sanders also added that his strategy was basically to play the best he could against the tough opponents he faced. Sanders has only been playing poker recreationally over the years, but it seems that after capturing two gold rings within the span of just a few days, the player is determined to try to play more tournaments in future. The post Scott Sanders Wins 2nd WSOP Circuit Gold Ring at Harveys Lake Tahoe, Takes Down Main Event appeared first on Casino News Daily. A Chinese group has expressed interest in building a $100-million casino resort in the Philippines’ Cagayan Special Economic Zone, despite President Rodrigo Duterte’s veto on the construction of new gambling venues around the nation. In a statement on its website, the Cagayan Economic Zone Authority (CEZA), the body overseeing the special economic zone, said that it has signed a memorandum of understanding with Shanghai Jucheng Supply Chain Management (Group) Co., Ltd. The company has revealed plans to build a Jeju Island-inspired resort with a gaming floor, theme parks, and a number of other facilities. According to the Chinese group’s website, its activities include bulk commodity trade, logistics, and customers clearance services, among others. However, it is not clear whether the company is involved in any other tourism projects. In its statement, CEZA said that the group has been looking into a tourism destination that matches the allure of South Korea’s Jeju Island, which is home to several integrated resorts, including ones that feature casino facilities. As mentioned earlier, the latest wave of President Duterte’s crackdown on gambling includes a ban on the construction of new casinos in the country. However, the Cagayan Special Economic Zone is regulated under the Republic Act No. 7922, which authorizes CEZA to award a casino license to an interested party. It is yet to be seen how the Philippines’ top official will react to the news of a potential new casino project. It emerged back in July that four international companies had submitted letters of intent to CEZA expressing their interest in building an integrated resort in the special economic zone. CEZA CEO Raul Lambino revealed that the companies in question originated from South Korea, Japan, Malaysia, and Hong Kong. The executive also said that three of the companies had pitched $100-million projects, while the fourth had presented a plan for the development of a $500-million integrated resort in Cagayan. The names of the companies were not disclosed back then. Mr. Lambino said in July that CEZA had 55,000 hectares of land available for development and that aside from a casino facility, any new resorts should also include hotels, entertainment facilities, and food and beverage options. In its Monday statement, CEZA said that Jucheng has also expressed interest in expanding its footprint across the economic zone through multiple other, non-gambling, operations. For instance, the company has revealed plans to engage in Cagayan’s fintech industry through a trade and exchange operation using the rapidly growing blockchain technology. The post Chinese Company Plans to Build Casino Resort in Cagayan, Despite President Duterte’s Gambling Ban appeared first on Casino News Daily. Florida-headquartered gaming and hospitality company Hard Rock International is eying expansion of its integrated resort business in Australia’s Gold Coast, local news outlet the Gold Coast Bulletin reported over the weekend. Reports about the casino operator’s interest in Queensland’s most popular tourism strip also emerged this summer. The Gold Coast is currently home to one hotel and casino resort – The Star Entertainment Group’s The Star Gold Coast. The major Australian operator has only recently been given the green light by the Queensland Government to expand its property. The planned expansion included the addition of four towers at the existing resort as well as multiple dining and entertainment options. The Star has said it would invest around A$2 billion into expanding its Gold Coast operation. While the Australian operator was given the nod to proceed with the expansion of its property, the Queensland Government is yet to approve the widely debated construction of a second integrated resort in the Gold Coast region. However, it became known that Hard Rock is pushing to be selected as the preferred developer of this second complex. The company operates casinos across its native US market, but is looking to expand internationally. It was picked earlier this year as the preferred bidder for the development of a major integrated resort scheme in the Spanish city of Tarragona and is lobbying actively to expand in the newly legalized Japanese gambling market. As part of its strategy to grow Queensland’s tourism industry, the state’s government has introduced not long ago the Global Tourism Hub concept, which involves the construction of integrated resorts across the state. The plan aims to attract both national and international investors and to boost Queensland’s A$25-billion tourism industry, which is estimated to be supporting more than 200,000 jobs. In a letter to the government from earlier this year, Hard Rock has said that it was particularly intrigued by the “holistic model” presented by lawmakers and that it was interested in developing an “entertainment-centric” property, the Gold Coast being its preferred location. Queensland Premier Annastacia Palaszczuk said on Friday during a Gold Coast visit that a second casino in the region is a matter yet to be discussed. However, reports emerged over the weekend that Hard Rock has approached the government and has presented it with a timeline for a A$2-billion integrated resort project. The reports about Hard Rock’s interest in a Gold Coast development have been met with overwhelmingly negative reaction by local club businesses and many members of Gold Coast communities. Doug Flockhart, CEO of Queensland Clubs, told the Gold Coast Bulletin that a recent research has shown that a second casino on the Coast would have a direct impact on at least 30 local clubs and could even destroy them, and indirect impact on hundreds of clubs around the state. The state’s community club sector annually contributes A$850 million back to communities and a second casino would affect adversely those contributions, Mr. Flockhart added. The post Hard Rock Plans Large Casino Expansion in Australia’s Gold Coast appeared first on Casino News Daily.